At present this list concentrates on those things predicted before the event, but will be expanded in the future to cover many facets of modern astrophysics and cosmology. Thornhill: An abundance of water on or below the surface of the nucleus (the underlying assumption of the "dirty snowball" hypothesis) is unlikely. The explosion removed many thousands of tons of material. But prior to impact, the calculated "water" output was 550 pounds per second; and not long after the impact, the calculated output was, once again, 550 pounds per second (See picture above regarding the return to previous level). So despite the impressive explosion, the envisioned sub-surface water refused to reveal itself. By NASA's own calculations, therefore, Deep Impact has only made matters worse for standard theory. Thornhill: So there is some small chance that astronomers will be surprised to see the comet split apart, if the projectile reaches the surface of the comet and results in an intense arc. Thornhill: These predictions remain but the intensity of the electrical effects depend upon the degree to which the comet is charged with respect to the solar plasma at the impact point. So it is disappointing that NASA chose a short period comet that only ranges between the orbits of Jupiter and Mars. Long period comets spend more time travelling slowly in the lower voltage regions of the outer solar system. So when they rush toward the Sun their electrical display is more energetic than the short period comets. Also, the same electrical circuit that drives the Sun energizes comets. The Sun’s activity is near minimum, so we may expect reduced cometary activity. Of course, none of these electrical considerations figured in NASA’s thinking. Thornhill: Electrical interactions with Deep Impact may be slight, but they should be measurable if NASA will look for them. They would likely be similar to those of Comet Shoemaker-Levy 9 prior to striking Jupiter's atmosphere: The most obvious would be a flash (lightning-like discharge) shortly before impact. What you see is something really surprising. First, there is a small flash, then there's a delay, then there's a big flash and the whole thing breaks loose. Thornhill:The electrical energy will be released before impact. 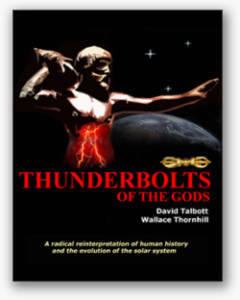 Thornhill: The impactor may form a sheath around it as it enters the coma, becoming a "comet within a comet". The plasma sheath could interfere with communications in the same way as experienced by the Space Shuttle during reentry. Finally, why were there no images returned from the impactor seconds before impact? The lower right image is the last from the impactor camera. Thornhill predicted an electrical flash before impact. Yesterday's TPOD reported the surprise expressed by NASA's expert on high-velocity impacts, Peter Schultz, when two flashes were seen. The lack of images in the last few seconds would be explained simply if the impactor was hit by a "cometary lightning bolt" seconds before contact. The "whiteout" seen in the lower right quadrant indicates significant electrical discharging near the impact point. Data from the communications team and the flyby spacecraft cameras should decide the issue. Thornhill: Internal electrical stress may short out the electronics on board the impactor before impact. That could compromise the guidance system and the success of the mission. Thornhill: The energetic effects of the encounter should exceed that of a simple physical impact, in the same way that was seen with comet Shoemaker-Levy 9 at Jupiter. It is now well documented that every scientist associated with the project was stunned by the energetic outburst. Thornhill: If the energy is distributed over several flashes, more than one crater on the comet nucleus could result - in addition to any impact crater. By tracing rays back to their source we noted the appearance of two ejecta centers immediately after the impact. Thornhill: It is advisable that investigators look at water abundances both close to the nucleus and in the far coma to see to what extent water is being formed away from the nucleus by the combination of negative oxygen ions with protons from the solar wind. The logical concern here is that these reactions will, by improper reasoning, give inflated values for the water ice abundance in the comet nucleus. Readings of the relative abundance of OH should drop in the immediate wake of impact, while in the days after the impact abundances of OH should rise. Though this is inconceivable under the standard model, preliminary data released does suggest this pattern. Thornhill: The primary distinction between a comet and an asteroid is that, due to its elliptical orbit, electrical arcing and "electrostatic cleaning" will clean the nucleus' surface, leaving little or no dust or debris on it. Both the volume of dust and its extraordinarily fine texture have created mysteries for cometologists. The ejected dust appears to be as fine as talcum powder. In no sense was this expected. But it is characteristic of "cathode sputtering", a process used industrially to create super-fine deposits or coatings from cathode materials. ...makes an observation in a NASA release on Deep Impact all the more noteworthy: "The image [of the nucleus] reveals topographic features, including ridges, scalloped edges and possibly impact craters formed long ago". Thornhill: The discharge and/or impact may initiate a new jet on the nucleus (which will be collimated - filamentary - not sprayed out) and could even abruptly change the positions and intensities of other jets due to the sudden change in charge distribution of the comet nucleus. An El Roque de los Muchachos observatory (La Palma, Spain) report states, "New jets appeared after the impact, the two jets observed in the previous night are still active. Also the curved expanding impact dust shell is visible at ~18 arcsec (corresponding to about 12,000km) from the comet nucleus". Thornhill: A mechanical impact will not produce the temperatures of an electric arc, which can be tens of thousands of degrees over a very small area. The problem will be whether temperature readings will have the resolution to be able to distinguish a very high temperature over a tiny area or merely an average over a large impact area. Anomalous high temperature readings could precede physical impact, accompany impact, and follow impact. An indicator of arcing would be the presence of atoms ionised to a higher degree than can be explained by the energy of the impact. We had seen very small white spots on photographs of comet Wild 2, and interpreted them as electrical arcs in the form of coronal discharges. The highest resolution photographs of Tempel 1, taken by the impactor, show numerous featureless patches of white-out, most located where the electrical hypothesis would put them - on the rims of craters and on the wall of cliffs rising above flat valley floors. This single feature, we believe, provides the "smoking guns" we have waited for. Since their initial suggestion that the patches could be highly reflective spots on the surface, we've heard no further comment on the subject. The signature of electric arcing should be clearly evident in the full stream of data now being analyzed. Thornhill: The impact/electrical discharge will not reveal "primordial dirty ice", but the same composition as the surface. In fact there was no change in measured water after the impact. Another observation from the Odin telescope in Sweden found that the total amount of water appeared to decrease after the impact, probably because of the injection of quantities of dry dust. Thornhill: Comets are the result of electrical discharge machining of planetary bodies that occurs in the catastrophic evolution of planetary orbits. It is far too simplistic to assume that the planets were formed along with the Sun and remained in their present orbits ever since. NASA researchers announced on March 13 another in the long procession of surprises about comets. The grains from comet Wild 2, trapped in aerogel and returned to Earth, were much larger than expected and made from the same high-temperature minerals as found in the most abundant meteorites. This discovery was so unexpected that an early sample was thought to be contamination from the spacecraft. Thornhill: Plasma cosmologists have shown that stars do not form by gravitational accretion. Stars form in a cosmic discharge, inside a plasma z-pinch. The dusty disks seen about some stars may not be due to gravitational accretion but are more likely to be matter expelled electrically by the central star. 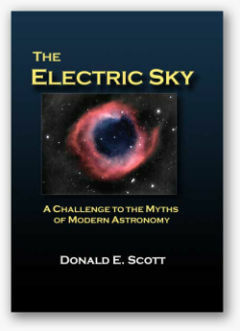 Electrical expulsion can also explain the formation of the observed close orbiting gas giants. In a hierarchical fashion, comets can be seen as the debris, or afterbirth, of a planet. They are not primordial. Hope Ishii of the Lawrence Livermore National Laboratory (LLNL) in Livermore, California, US told the New Scientist: “Wild 2 should still be considered a comet, because it is throwing off gas and dust as ice on its surface evaporates in sunlight. This is a good indication that there is a continuum between asteroids and comets." This bolsters the view that there is no sharp dividing line between comets and asteroids. Voyagers 1 and 2 reached the boundary of the Sun’s influence in 2005 and 2007, respectively, taking point measurements as they left the solar system. Before IBEX, there was only data from these two points at the edge of the solar system. While exciting and valuable, the data they provided about this region raised more questions than they resolved. IBEX has filled in the entire interaction region, revealing surprising details completely unpredicted by any theories. The global dust storm that engulfed the planet Mars in August and September of 2001, involved a packed assembly of "dust devils" carrying great volumes of Martian dust into billowing clouds. The image above, released December 30, 2003, shows apparent vortices (a word that would not be used by NASA scientists) rising into billowing clouds from the margins of the south polar ice cap in the Martian summer. The caption accompanying the release, reads: "Like billowing smoke from a brush fire, clouds of dust are seen streaming off the edge of the Martian south polar cap. The southern hemisphere is in the middle of its summer season and experiencing a multitude of small dust storms like this one. The net effect is an increasingly dusty atmosphere across the whole planet and with it, warmer atmospheric temperatures." When viewed more closely it will be seen that the channels do not follow topography in the fashion of flowing liquid. A recent HiRise close-up image of a crater appears to confirm this. This will be clarified in a future TPOD. Since the channels are carved into a smooth surface (i.e., a surface not strewn with boulders and rocky rubble), the immediate surroundings should have preserved more subtle evidence of particle beam activity, electrostatic sculpting, and glassification. The shiny appearance of the ravines is at least consistent with the possibility of glassification, though far from definitive. Further investigation is pending. Cratering in connection with channel formation must be anticipated, particularly at the starting points and terminations of the channels. Recent HiRise images confirm the prediction of craters strategically placed along the ravines, particularly at the terminations. This will be discussed in a future TPOD. Thornhill: The Electric Universe also predicts, experimentum crucis, that BOTH poles should be hot, not one hot and the other cold. Saturn's chilly north pole boasts a hot spot of compressed air, a surprising discovery that could shed light on other planets within our own solar system and beyond, researchers said on Thursday. Scientists already knew about a hot spot at Saturn's sunny south pole but data from the Cassini spacecraft now shows that the winter pole drenched in darkness also has a hot spot, said Nick Teanby, a planetary scientist, who worked on the study. With this Cassini mission we can also see the winter pole, which we are not able to see from Earth because of the tilt of the planet, said Teanby of the University of Oxford. "We didn't expect it to have a hot spot at the north." The hot spot is essentially a small, narrow region hotter than the gas surrounding it, the international team reported in the journal Science. Regarding Enceladus, electrical theorist Wallace Thornhill and his colleagues suggest there is no geyser of subsurface water analogous to the Yellowstone geyser. They say that if NASA will look they will find that the jets 'move across the surface'. And in their motion across the surface, the electric arcs that produce the jets are 'creating' the observed channels as they excavate material from the surface and accelerate it into space. It turns out that NASA has had sufficient data in hand for at least several months confirming that the jets do indeed move across the surface (see for example [ this video], in which the jets move in opposition to the visual rotation of the sphere). Thornhill: We should expect to see family traits amongst the members of the Saturnian family — including the departed Earth, Mars and Venus. For example, the moon Titan, which is larger than the planet Mercury, seems to be a close sibling of Venus, probably born from Saturn at about the same time. That Titan may be young is hinted at by its eccentric orbit, which cannot have persisted for billions of years. So we should be alert to similarities between Titan and Venus. "The images show a landscape that is clearly still being shaped... its surface today is largely crater-free." That is precisely what was said about Venus when the Magellan Orbiter revealed that planet's surface. However, like Venus, there may have been no impact craters to fill. Like Venus, surface temperatures are globally uniform on Titan within a few degrees. It is thought that there is a greenhouse effect operating on Titan. However, the heat of Venus is due to its origin and has nothing to do with a greenhouse effect. The same will likely be true for Titan. Like Venus, Titan seems not to have a magnetic field and yet it has a distinct magnetotail. One large circular feature, suspected of being a crater until closer examination showed it to be flat, closely resembles the pancake domes seen on Venus that are produced by magma welling up to produce a bubble that then slumps down to a nearly flat profile. Titan's electrical plasma interactions may be like those of Venus. Titan shines on the dayside in UV light too brightly to be explained by solar radiation. However, radar, infrared and radio observations of Titan have not found signs of a hydrocarbon ocean. In fact one radar return was "of a type that we would expect to get back from Venus". The spacecraft measured the temperatures of Io's "volcanic" hot spots and gave readings, averaged over a pixel, that were hotter than any lava on Earth - in fact, too hot to be measured by Galileo's instruments. Thornhill: On the contrary, most of the dark patterns seen radiating from the crater in this image of the Marduk "volcano" are not lava flows. They have the shape of lightning scars on Earth and are caused by powerful currents streaking across the surface to satisfy the arc's hunger for electric charge. They rip huge sinuous furrows in the soil and hurl it to either side to form levee banks and side lobes. The stubby side channels will be found to have rounded ends like those seen on Martian "rivers". The best resource for this is the closeups of Io's "volcanoes" that show the stubby, round-ended channels. One of the clearest is PIA02545 where you see the scalloped channels off to the right of the so-called "caldera." None of the expected volcanic vents could be found. Rather, the plumes of the "volcanoes" are actually moving across the surface of Io, an exclamation point being provided by the plume of Prometheus which, in the years since Voyager, has moved more than 80 kilometers. Thornhill: The "lava lakes" themselves are merely the solid surface of Io etched electrically by cathode arcs and exposed from beneath the sulfur dioxide "snow" deposited by continuous discharge activity. Therefore, they will not reveal the expected heat of a recent lava flow. As predicted by Thornhill, the discharging was discovered to be focused on the edges of the so-called "lava lakes", though the rest of these dark fields are comparatively cold. Thornhill: If the equatorial ring shows the Birkeland currents in the outer sheath of an axial plasma current column, then the supernova outburst is the result of a cosmic z-pinch in the central column, focused on the central star. It is important to note that the z-pinch naturally takes the ubiquitous hourglass shape of planetary nebulae. No special conditions and mysteriously conjured magnetic fields are required. The Red Square shows the stellar Z-pinch in close-up and we can see the Birkeland filaments for the first time, called 'combs' in the Science paper. They match the electrical model. Supernova 1987A was successfully decoded. Stephen Smith: Astronomers have infected physicists with the "hot gas" theory, causing a 50 year failed experiment with nuclear fusion. Squeezing hot gas into a volume small enough for fusion to take place has not worked and we predict that it will never work. The theory of star formation through fusion reactions is untenable so utilizing the theories of plasma behavior might be a more productive path. Still waiting for a success story from the Tokamak project. 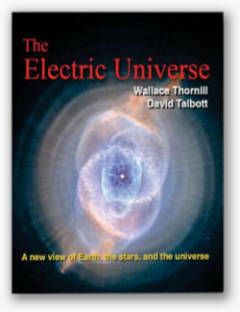 Pending predictions of the Electric Universe can be found here. above and for permission to reproduce same.